Mine Owner, Delinquent On Safety Fines, Announces Run For West Virginia Governor : The Two-Way More than $2 million in penalties against Jim Justice's mines had not been paid as of March. The mines involved had an injury rate that was double the average rate for coal mines. 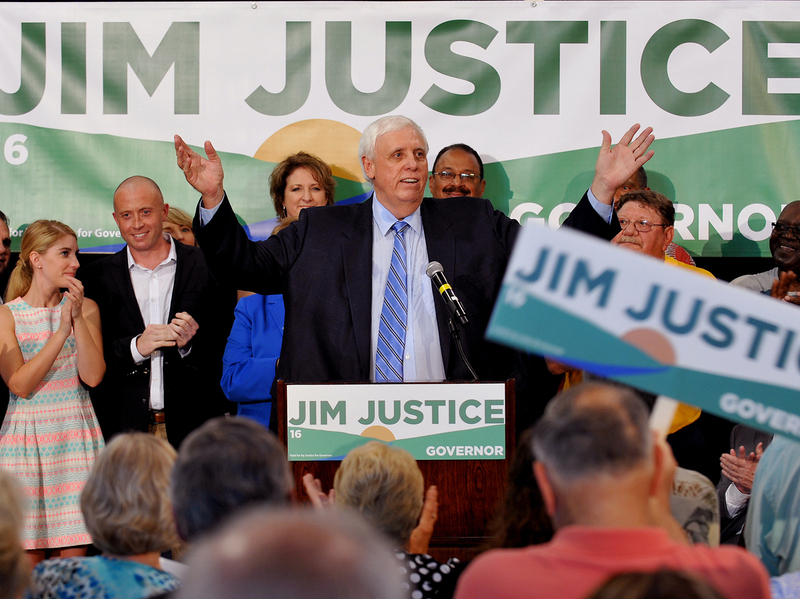 Businessman Jim Justice announces he's running for governor of West Virginia. Federal regulators say that as of March he hadn't paid more than $2 million in fines for safety violations in his coal mines. Billionaire Jim Justice is said to be West Virginia's richest man. Now he wants to be the state's top elected official. "You need somebody that loves our state," Justice told a crowd of supporters, "and somebody that doesn't want a nickel for doing it." The philanthropist is worth $1.6 billion, according to Forbes, and also has vast agricultural holdings. But it's his operation of dozens of coal mines in five Appalachian states that is already an issue in his gubernatorial run. The West Virginia Republican Party is already citing the series in its attacks on Justice's candidacy. In response to questions last year from NPR/MSHN, the top executive at Justice's coal mining company said that the delinquent penalties would be paid. Justice "is an individual that does not run from his obligations," said Tom Lusk, chief operating officer of Southern Coal. "He's made it abundantly clear that there's no way we're not going to fully meet and satisfy these obligations." Lusk said the company had begun making payments of $100,000 a month toward the delinquent penalties. But as of March 2015, the federal Mine Safety and Health Administration reported that Justice's coal mines owed more than $2 million in mine safety fines. "We've stuck to the 100k payments," Lusk said in an email Monday, adding that he met with regulators to develop a formal payment plan. MSHA's records indicate some delinquent penalties have been paid but more recent safety violations have also become delinquent. Justice has also been sued for allegedly failing to pay vendors, according to the Charleston Gazette. Greenwire reported last year that Justice coal companies failed to pay about $2 million in environmental fines. And a recent investigation by the Lexington Herald-Leader found that a Justice mining subsidiary in Kentucky hadn't paid $660,000 in property taxes. At a news conference after his announcement, Justice was asked about the overdue taxes and fines and whether the state's voters can be expected to pay their obligations if he has been late on his. "We're taking care of them," Justice responded. "We'll absolutely ... make sure that every one of them are taken care of."